Russell Allen and Jorn Lande are two of the finest metal/hard rock vocalists working today, and their respective catalogs are quickly moving them into the elite company of the legends that are their inspiration. In addition to the output of their main bands (SYMPHONY X and JORN), both have been/are involved in several other noteworthy projects. 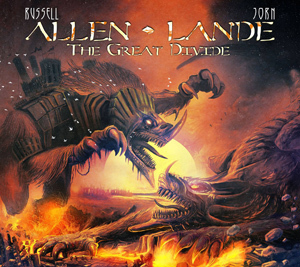 One of the more visible and long-running of these is their collaboration as ALLEN LANDE, which has yielded The Battle (2005); The Revenge (2007); and The Showdown (2010) - all with Swedish guitarist Magnus Karlsson (MAGNUS KARLSSON'S FREE FALL (solo), PRIMAL FEAR) handling songwriting and production duties. The twist on The Great Divide (2014) is that noted Finnish guitarist Timo Tolki (STRATOVARIOUS, REVOLUTION RENNAISANCE, SYMPHONIA) took over the helm. The results are in a similar vein as the previous releases, but this time out the songs and performances seem stronger - with the material generally having a harder and more metallic edge. Like his predecessor, Timo played guitars, bass and keyboards, accompanied by Jami Huovinen (RING OF FIRE, SENTIMENT) on drums (who turns in a solid and polished performance). Timo's tight rhythm playing and melodic leads are on target, but where he really excels is in the writing department. The riffs and songs that he put together just might have been the breath of fresh air needed to keep ALLEN LANDE vital. While generally heavy, The Great Divide also has elements of hard-edged AOR/traditional metal/power metal; the end result is that this blend helps to keep the disc interesting. The songs are basically an even mixture of duets ("Down From the Mountain") and solo features from Russ ("Bitter Sweet") and Jorn ("Lady of Winter"). There's really no need to dig any further into an analysis of the track list, as The Great Divide is about as good as it gets if you are a fan of any of the aforementioned genres or the individual players on hand. Dennis Ward (PINK CREAM 69, PLACE VENDOME, UNISONIC) provided the mix, and it seems that he has the magic touch. Just about everything he does is stellar, and thecrisp, clear and punchy sound on this release is no exception. Hats off to Timo for his excellent writing and production, and to Allen and Lande for the killer vocals. Neither one of these guys is giving an inch and both remain firmly at the top of their game. Rest assured that The Great Divide is all class and a standout 2014 release.